If you're here for the Hodgepodge Questions you'll find them just before this post. Let's recap. We moved from North Jersey to South Jersey to South Carolina, but made trips to Canada, Maine, and Tennessee in between. Or at the same time. Whatever. Also, it's not Monday, it's Tuesday but I started this post on Monday prior to upgrading our browser and entering all kinds of technology h-e-double hockey sticks, which is why I'm now posting a throwback Monday should be Thursday, on a Tuesday. Hubs hometown recently constructed a brand new high school, and they were hosting an all-years reunion to mark the occasion. 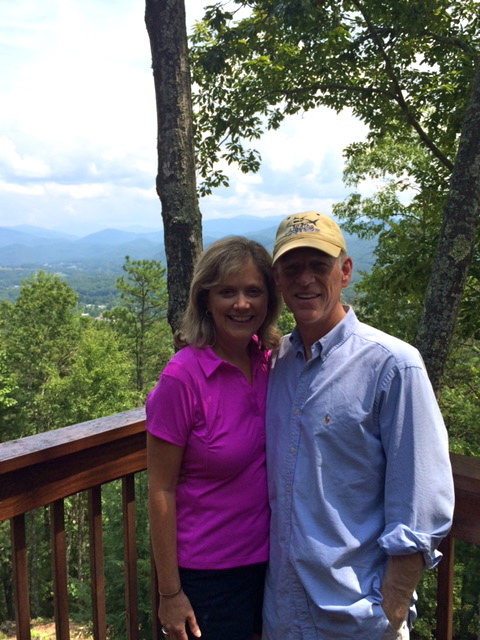 We trekked over to Tennessee to check it out, and also to visit with family since we were in the neighborhood. Neighborhood is defined very broadly when you're us. My father-in-law had celebrated a birthday earlier in the week, so his boys took him out for his favorite fried catfish supper. We ate at Allisons, which is a fun little spot in Friendsville, TN and is only open in the summertime, and only on the weekends. You've gotta go while the gettin' is good. 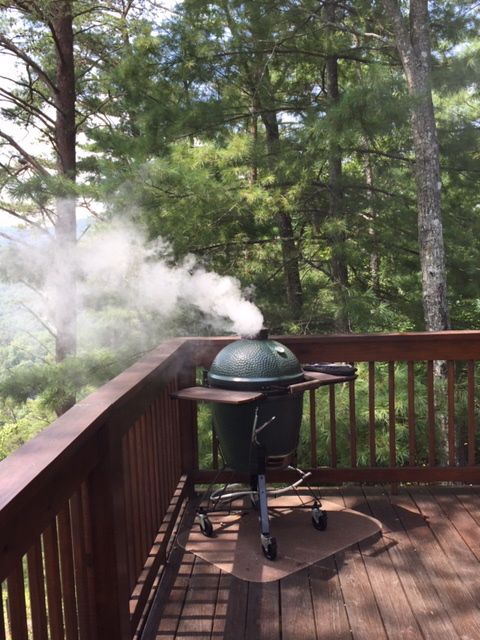 My brother-in-law is a master of The Big Green Egg, and hubs played sous chef while they grilled some truly outstanding ribs. 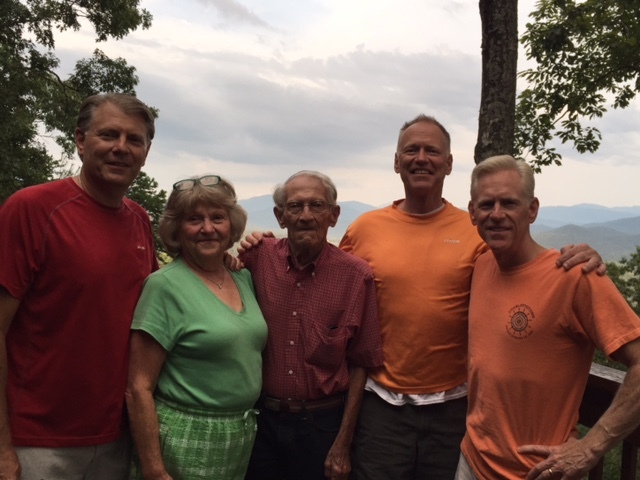 We were missing the only girl child in the family, but I did get a picture of my in-laws with all their boys. I'm pretty sure there's an extra star in my mother-in-law's heavenly crown since these boys gave her a run for her money in their growing up years. Occasionally they still do. ahem. 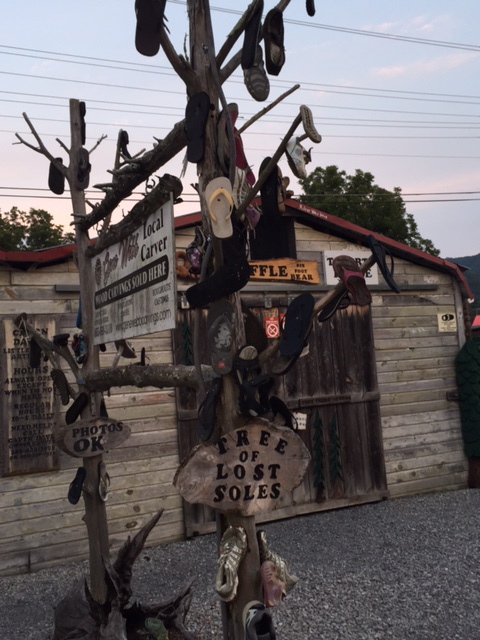 We drove around looking for signs of wildlife, but all we found was a Tree of Lost Soles. It was a nice low key weekend with beautiful scenery, wonderful meals, and sweet time with family. Knowing we only had a three hour drive home, as opposed to our usual 12, was delcious icing on the proverbial cake. Great fun, great memories and wonderful photos to document it all. What a blessing to still have your in-laws! They look terrific! You are the "goiniest" woman I know. How do you know where you are when you wake up of a morning? :o)) I've spent so much time in Tenn. throughout the years and it is such a beautiful state. I think Mom's of all boys deserve an extra jewel in their crown for sure. You have definitely had a busy summer! It's been fun to follow you around. Loved the pictures of Tennessee. How smart of you to retire to a place that is closer to the folks. It sounds like it was a perfect weekend with some beautiful scenery. Mark wants one of those Big Green Egg grills. Wow my husband would be envious! We live in Jersey but he wants to go South in the worst way! Glad to fins your blog via Preppy Empty Nester!